Unfortunately I missed and probably would have anyway, but allow me to regret that Open Source Embroidery closed a few days ago at The Museum of Folk Art & Craft in San Francisco. Fortunately, not only do museums keep online archives, but they are now producing marvelous videos that help alleviate one’s disappointment. This show was of particular interest to me because of Leah Buechley’s e-textile work, which includes the goal of promoting math and science education. I first learned of LB through an article in Volume 1 of Craft: that first appeared in 2006. I was living in Boulder, CO at the time, and was thrilled to discover that LB was in the CS doctoral program at the U of CO. I decided to track her down. I had worked in the women in engineering program (2001-2004; now BOLD) and environmental engineering (2004-2006), so I knew about the Discovery Learning Center and what an accessible place it is. Leah was interested in meeting local weavers and textile artists and teaching them the basics of creating LED patterns on wearables. The Handweavers Guild of Boulder hosted a presentation and there was a great deal of interest from the group. Unfortunately the date/time didn’t come together for a workshop and Leah went on to an assistant professorship at MIT’s Media Lab. Before she left I did take the time to visit Leah at the Craft Technology Lab at CU and practice soldering a few of the LED “sequins” together so that I could try a few designs on my own. I’m sorry to say my experiments are still packed away at the moment. 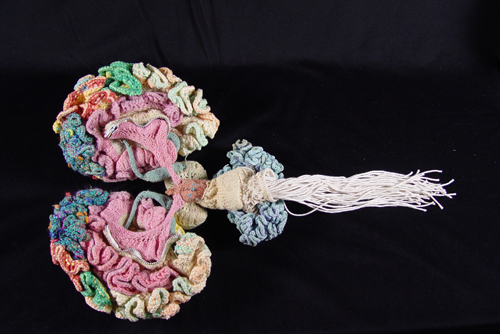 Wow, embroidered brains—where have I seen that before? Dave called me at home about a week ago, saying there was a show at the Warneford that I wouldn’t believe. He said it had pictures of deadly diseases, like breast cancer and HIV. Because of my recent fascination with MRI’s and all those colorful pictures of human insides, I thought he was joking. I had, after all, just put up my embroidered brain patches in the Warneford’s Apple Room. But whereas I have been embroidering miniature versions of human organs, the show at Warneford’s Artscape Gallery contained super-magnified images of microscopic threats to human health and survival. The exhibit, called “Designs for Life,” is an impressive textile collaboration, rivaling The Dinner Party in scope, complexity and emphasis on communal participation. This textile art/science project reveals and celebrates the microbes and particulate matter that affect human health. 30 panels, each 50×50 cm, were created through the efforts of the lead designer Anne Griffiths, 1000 scientists and 150 members of the Womens Institute of Oxfordshire. Diamond Light Source, the scientific partner in the project, contributed images from its synchrotron, a ‘super microscope’ capable of magnifying a flu virus or Alzheimer plaque to reveal its structure and aid in biomedical research. I’m fascinated by the new and old and how they intersect. I try to keep informed on the latest scientific findings and look for ways in my artwork to combine them with references to historical art and events. Most recently, I have become interested in Magnetic Resonance Imaging (MRI) and other imaging technologies, which have allowed us access to a new visual terrain, one that appears to be highly tactile. It is the urge to explore these with thread and needle, in texture, color, line and shape, that led me to try my hand at stitching the circuitry of the brain. My previous work, miniature, hand-embroidered patches about female rites of passage, have been published in Harpers, Ms. and other publications. The female merit badges identified biological and behavioral aspects of being female, to question, celebrate and amuse. I’ve also created emblems that pair medieval imagery with computers and technology. Recent “pressure point patches” illustrate mind-body conditions such as chronic pain and menopausal symptoms. and other brain art in the first place. 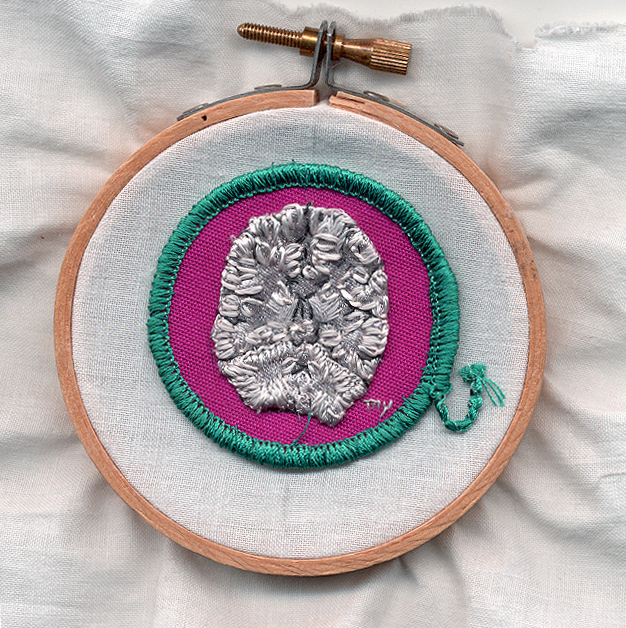 I thought I was the first person in the universe to stitch brain images, but maybe not. I started collecting MRI images, and stitched my first brain “patches” in early 2004. I was also stitching my first guts and heart, so it seemed like I had a nice Wizard of Oz theme going. But the brains were especially seductive, because of the latest MRI (magnetic resonance imaging) technology. Lush images in super-saturated colors had been appearing in the media, as illustrations of the latest discoveries in neuroscience. 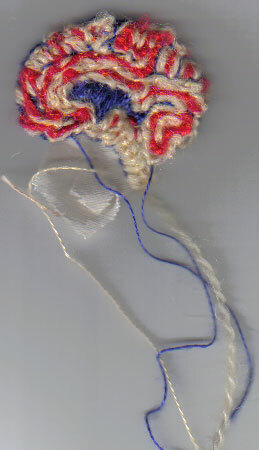 This brain slice was the first image, and I also have a work-in-progress that includes a stitched brain. I’m not the only one attracted to neuroscience imagery. There is even a Museum of Scientifically Accurate Fabric Brain Art, and I’m curious if they’ll consider my renditions precise enough.